Are you looking for reliable marketing database to reach out to your target prospects in the Telecom Industry? Blue Mail Media provides Telecom Industry Mailing List, Telecom Industry Email List, and Telecom Industry Telemarketing List to help marketers seamlessly connect with their most valued prospects. Driven by integration, IoT, mobility, cloud computing and big data, the worldwide growth of telecom sector looks positive in the coming decades. If you are a marketer of products, solutions or services that cater to the enterprises operating in the telecom sector, Blue Mail Media can help you with highly accurate and reliable marketing data to aid you in your multi-channel promotional campaigns. Whether you are planning to run a telephone, email or mail campaign, Blue Mail Media’s Telecom Industry Mailing List can give you access to all the relevant information to meet your objectives. Blue Mail Media has been proactively helping organizations in multiple industries with qualitative data for their marketing activities. Our highly skilled team of data scientists, researchers, and industry experts put immense efforts in maintaining the quality of Telecom Industry Database throughout the process of collection, verification, and update. Not only we offer you pre-packaged to help you with your immediate marketing needs, but also we offer you to get your list customized based on your business specific preferences. Not only we offer you pre-packaged Telecom Industry Marketing List to help you with your immediate marketing needs, but also we offer to customize your list based on your business specific preferences. Our widespread data partners’ network spread across the USA, the UK, Canada, Europe, North America, APAC and other regions strengthen us to serve clients beyond geographical constraints, and in a global yet local approach. 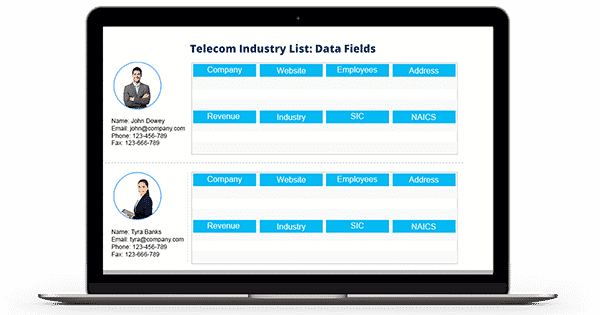 Using our Telecom Industry Mailing Database, you are sure to unlock greater interactions on your marketing initiatives and gain significant response rate, conversion rate and ROI.